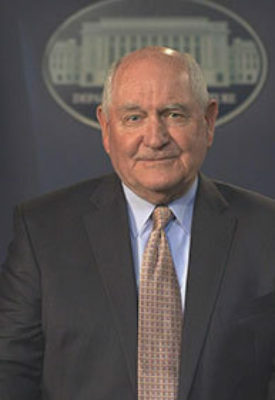 U.S. Secretary of Agriculture Sonny Perdue has announced the creation of an undersecretary for trade and foreign agricultural affairs in the U.S. Department of Agriculture (USDA), a recognition of the ever-increasing importance of international trade to American agriculture. Perdue made the announcement standing by barges filled with agricultural products along the banks of the Ohio River. As part of a reorganization of USDA, Perdue also announced the standing up of a newly-named Farm Production and Conservation mission area to have a customer focus and meet USDA constituents in the field. Finally, Perdue announced that the department’s Rural Development agencies would be elevated to report directly to the secretary of agriculture in recognition of the need to help promote rural prosperity. USDA’s reorganization seeks to place agencies in more logical order. Under the existing structure, the Foreign Agricultural Service (FAS), which deals with overseas markets, and the Farm Service Agency (FSA), which handles domestic issues, were housed under one mission area, along with the Risk Management Agency (RMA). It makes much more sense to situate FAS under the new undersecretary for trade, where staff can sharpen their focus on foreign markets. Additionally, a new undersecretary will be selected for a newly-named Farm Production and Conservation mission area, which is to focus on domestic agricultural issues. Locating FSA, RMA, and the Natural Resources Conservation Service under this domestically-oriented undersecretary will provide a simplified one-stop shop for USDA’s primary customers, the men and women farming, ranching, and foresting across America. Under the reorganization plan, the undersecretary for natural resources and environment will retain supervision of the U.S. Forest Service. A reduction in USDA workforce is not part of the reorganization plan.